Golden Delicious is a very popular as a supermarket apple variety, and now undergoing something of a rehabilitation amongst apple enthusiasts who are re-discovering its potential. The variety was discovered by a West Virginia farmer at the end of the 19th century. It is generally considered to be a seedling of Grimes Golden, to which it bears a strong resemblance. The variety was soon taken up by the famous Stark Brothers nursery, who were so impressed by it that they bought the original tree and an area of land around it. The tree lived on into the 1950s, by which time it had become firmly established as one of the world's great apple varieties. 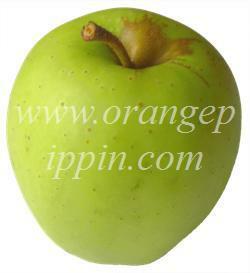 Golden Delicious is now planted in all the major warm apple growing areas of the world. From a grower's perspective Golden Delicious is an attractive proposition - very easy to grow, heavy crops, and fruit which keeps in storage for a long time after harvest. These qualities meant that by the mid-late 20th century Golden Delicious had become one of the mainstays of supermarket apple sales, along with Red Delicious and Granny Smith. Towards the end of the 20th century when flavour once again became important in apples, detractors saw Golden Delicious as bland and boring, and it became a victim of its own success. However enthusiasts are increasingly re-discovering Golden Delicious, and recognising that behind the mass-production and supermarket shelf-appeal there is a very good apple. Part of the problem is that fruit picked for supermarkets is often picked when still green, and then stored for months before sale. In contrast when allowed to ripen to a golden-green color on the tree the true flavour is revealed - exceptionally sweet and rich, almost like eating raw sugar cane. Golden Delicious is also a versatile apple, and can be used both for dessert and cooking purposes, and it has an attractive appearance - which can indeed be golden if left to mature on the tree. Furthermore, there is no doubting the importance of Golden Delicious in the sheer number of new varieties which have been raised from it. You do not need to be a professional grower to realise that crossing Golden Delicious with Cox's Orange Pippin (or their respective offspring) might lead to something with both the sweetness of Golden Delicious and the richness and complexity of Cox, and that is indeed what many have tried. That other supermarket staple, Gala, is a good example of this strategy. Golden Delicious can grow well in the UK provided you have a warm and sheltered microclimate. 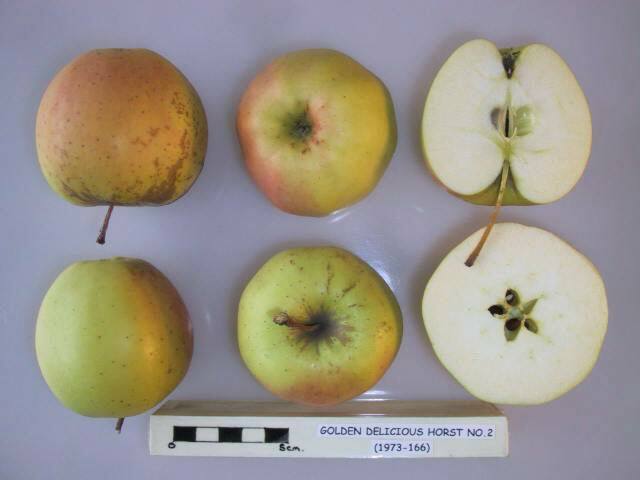 Our photo shows an English-grown Golden Delicious - not the perfect specimen you might see in a supermarket, but still a nice crisp sweet apple. The variety known as Yellow Delicious is believed to be a synonym for Golden Delicious, possibly the result of unauthorized propagation from the original Golden Delicious tree. When I was a lad the Golden Delicious apples in shops were yellow/golden and often freckled. They were choice apples and full of flavour. Move on some 30/40 years and I find it hard to recognise the apples sold under this name - they are hard and green and nothing like the apples from my childhood. I read somewhere that these apples are nowadays picked unripe for the British market as UK supermarkets like the keeping qualities of the unripe fruit - and the consumer has no idea what they're missing! I've tried Golden Delicious both from grocery stories and directly from local Maryland orchards. I've never liked them. Even when tree ripened the flavor is weak (the famed "pear drop sweetness" is too mild) and it has none of the tartness or crunch I look for in a good desert apple. For cooking it might do well in a delicate French tart, but it can't hold up to other American heirloom apples for a good pie. On the plus side, I've noticed children like these apples and the partially self-fertile trees are good for the home gardener. Interesting to read these comments. I have a GD tree in my little home orchard in VT. It has been the most consistent, prolific bearer in the short five years I've lived there. Since I've been pruning, thinning and mulching I've seen some improvement and hope for more as I go. I recommend Michael Phillip's books on organic fruit growing. There's a lot to it, lots to learn. One thing that's true for sure is that there are many factors in fruit quality so that's why some people think GD are truly delicious and others think they are awful. I love studying about apple varieties and orcharding. Hope you do too. Very very good variety ! Very solid reliable production and good pollinators. As with all fruit far better when grown local verses supermarkets. Dave. Duquesne, PA.
We have two trees, one in the old orchard that was my favorite apple among the other varieties cultured, so in the new garden we planted another tree. Fruit at the supermarket varies from insipid to just fine, but picked directly from the tree is delicious. I must admit that both apple trees are small and, if untreated like mine, suffer badly from apple scab, maggots and/or brown rot depending on the year. In sum, my excitement for the variety has decreased in recent years and is not so versatile like other varieties, but if harvested at its peak directly from the tree is a very good summer apple to eat in fresh; crispy, sweet, moderately acidic, of a medium size and not floury at all. here in southeast Michigan, we had the coldest winter in history in the winter of 2015. With one night during bloom time it hit -28 F. I wiped out every Peach, Cherry, Apricot and most of the Apples. The only tree in the large orchard that had apples was the Golden Delicious. This is also one my best tasting apples so I was pleased with that. I have a few in a sheltered area that produced but for some reason the flavor is best in the open orchard. Mine has a hint of ginger and very sweet. I do think they are far better if you let them sit for a week after picking them but they are great right off the tree too. I've been trying to grow apples for the past five years. This year, I started with 40 thinned apples, several varieties, first ones, expecting a modest harvest. Raccoons got all but 2, both Golden Delicious. I ate one last night. Scrubbed the soot off with a vegetable brush. Totally russeted, dirty looking even when cleaned. Cored and sliced, beautiful juicy white flesh, no blemishes on the inside. Mostly sweet, some tart, nice crunch. Sweetness nuanced, not just sugary. This had a distinct cinnamon overtone into the finish, delightful! Clean appley residual, lasted about 10 minutes. Understand, this has been 5 years in the making so I'm sure that I am biased. I'm modifying my cages and have a trapping program in force. My family thinks I'm nuts. Ready for more next year. When fresh off the tree, there no better apple. However, I have *never* had a store-bought one that comes anyone close. Most often, they are tragically mushy and bland. A fresh Golden is crisp and very sweet. Supermarket goldens do not do justice to the goldens found at a farmers market!!!!! I have two of these trees. One has yet to bloom, and the other has bloomed for years, and finally got a little pollen last spring. I got about seven apples from it. They did not look like the ones in the picture, but were more yellow with a hint of green. They were the best apples I'd ever tasted. I thought Gala was my favorite until I tried these from my orchard. I just added another Golden Delicious tree, and I have two Anna's and a Yellow Dorsette that are going in once I get more land cleared. I am very excited about the Golden Delicious. I agree with Tom - the first post on here. Either the clone of Golden Delicious grown commercially or the treatment of the apple - the way it is grown or stored - has changed. In the mid 1970s, in a penny-pinching student hall of residence, we had cheap French Golden Delicious apples with cheap chalky cheese for our packed lunches; and they tasted great! This version of Golden Delicious was not juicy; it was firm rather than crunchy; never mushy or woolly. It had a subdued sweetness with a hint of honey. Anything sweeter would have clashed with the cheese; this complimented it perfectly. This itself was probably not the "real" Golden Delicious - the apple was already "owned" by the supermarkets - but it was a lovely version of it; I would plant it myself if I could find it. Meanwhile, the present-day supermarket offerings are bland, with an empty, watery sweetness and a sense of disintegration in the texture; almost the opposite of the mellowed honied firmness that I remember. The ideal apple for supermarkets, consistent in shape, size and colour, but generally tasteless. If growing apples at home choose something with some taste that the shops don't stock. Look for GDs from the eastern US - the limestone soil makes for great apples. Easy tree to grow and the best are YELLOW with a red blush. There's a reason that this is one parent from most other really good modern apples - it's fantastic and addictive when well grown. We inherited a small young apple tree from my mother-in-law in 1990 which was growing in her garden 1.000 ft up in the South Wales Valleys, producing tiny fruits. We dug it up and planted it on our allotment in Cardiff - eventually it started to develop and for many years has produced volumes of apples. I use them for cooking in Sept/Oct when green - needing very little sugar, (I use lemon rind or mix with other fruits like Autumn raspberries, blackberries or cape gooseberries - grown in a greenhouse - to give added flavour). Later towards end October/Nov. when they ripen further and turn from green to yellow they are super juicy (and very sweet) - a very unexpected delight as I would not buy a golden delicious as to me they have little flavour. Until 3 years ago I had no idea the variety of this apple tree until an Italian allotmenteer suggested it was a 'Golden Delicious'. I was surprised as I'd no idea this apple could taste so surprisingly good. I am often picking them off the tree after the leaves have dropped when they are so good for eating. Not a great keeper unless kept in a cool place which is why I leave them on the tree for as long as possible and before the birds eat them all. I keep it fairly hard pruned so as not to grow too high and it never fails to produce lots of fruit. Also on the allotment I grow a fairly large green cooker, similar to Bramley, in addition to a small Sunset apple tree and Charles Ross - both excellent eaters especially the CR which are huge apples except it does not keep long after picking - goes dry and woolly in flavour. We planted one in our small garden 40 years ago supposedly on a small rootstock which produced wonderful apples, good enough for showing at Horticultural Shows until it grew too big and had to be severely cut/pruned - starting to grow a few fruits again. Hi Amy I have tree with two verieties grafted onto it James Grieves and Golden delicious which as you say have never been green or yellow but green with some red .I wondered if it was another variety as it looks more like the James Grieves. The apple in the picture is what the Golden Delicious look like here at Shop n Save but not the apple I remember eating as a child. Am I correct in saying that apples do not ripen after they are picked? If so why are these very unripe hard and marginally digestible specimens being called Golden Delicious? To:Amy from Cleveland, Oh RE: your red apples Some fruit trees are grafted http://www.midfex.org/m/whygraft.html They have the root stock of one variety and the trunk and branches of another. Your tree may have suffered the loss of the desired graft while retaining the rootstock and continued to grow. I may be wrong though. Does anyone know if Golden Delicious apples start out looking like a regular red apple and then change at some point? I have some growing on a tree that was tagged as Golden from the nursery but the apples are definately NOT yellow. They are greenish and red. last month I used GD for my experiment in lab. The rest was not used, and I though I'd just eat it. It was delicious: a bit tart, sweet and crisp. I love it! btw, one should try to buy the apples direct from orchard. I'm a little confused as to what this type of golden greeny apple is bred from? Is a green apple supposed to ripe and ready to consume? Or is it supposed to turn yellow? I'm a big fan and consumer of the yellow Golden Delicious. The Golden Delicious is a very popular apple with people where I work and, knowing I'm a bit of an apple enthusiast, are always asking what I think of them. It'd been so long since I had one that I had to go and buy some in order to comment. I wish I hadn't. They were soft, sugary and crumbly. I would love to try one direct from and orchard, however, after reading some of the other comments. I find these too soft and crumbly too often. These are great for eating fresh and for kuchen and other desserts when just ripe (somewhere between green and gold.) When overripe, only Red Delicious is blander. If you want a good Golden Delicious, find one in the store that is "golden" in color with some russetting of the skin, not the insipid greenish examples normally found. Even better, when the Goldens are actually supposed to be in season, buy them direct from the orchards - at the numerous fruit stands in the Wenatchee area, you can find good Goldens direct since russetted fruit can't go to the packing houses. I have never had a decent Golden Delicious! I grew up on the West coast & always hated golden delicious apples because they were mealy and bland. When I moved to Virginia 8 years ago I re-discovered this apple at the local orchards & it is now my favorite -- crisp, good sweet/tart balance & wonderful flavor. In Browning's book "Apples" he states that the Golden Delicious should never be grown West of the Mississippi -- he is absolutely right!! Try this again from an Eastern orchard and you may change your mind. I've never considered an apple "boring". :Simple, yes, no complex mixture of flavors, but boring? My question is, has Golden Delicious changed over the years? When I was a kid (I'm in my 40s), I could tell GD by looking; they'd have an almost translucent quality to their skin. And they were also perfect for long, long storage. They might get wrinkly, but they just got mellower, kept the good flavor, never got "mealy" or bruised or rotten. Now, what I see bagged as GD don't have any of those qualities! Dorsett Golden - Golden Delicious is probably the parent, or possibly grand-parent of Dorsett Golden.